The UK music scene of the 1980s established a classic era for synthpop acts. Among them, Howard Jones was always one of the more intriguing artists with his solo outings marking him out from the plethora of electronic bands of the time. With a career that flourished on the back of hits such as ‘New Song’, ‘Pearl In The Shell’ and ‘Like To Get To Know You Well’, Howard Jones stood out as an electronic artist that was capable of bringing warmth to the world of synths. His 1984 debut album Human’s Lib sealed the deal when it landed a No. 1 spot in the UK charts. Meanwhile, realising the limitations of one bloke behind a set of synths for live performances, Jones recruited mime artist Jed Hoile to give concerts a more dynamic visual presence. Jones has continued to write and record music up to the present day with releases being coordinated on his own Dtox label. His live shows, likewise, continue to engage audiences through new albums such as Revolution Of The Heart and Ordinary Heroes, as well as showcase performances of his classic albums Human’s Lib and Dream Into Action. Cherry Red continue to be the label of choice for many reissues and, having acquired the Warners back catalogue of Howard Jones, Best 1983-2017 will mark their first release as part of a long-term plan to work with the musician’s extensive songbook. This compilation offers a retrospective that utilises that material in a fairly comprehensive 3-CD set which encompasses Jones’ career from 1983 through to 2017. It could be argued that this new compilation might be a bit redundant when compared to 2003’s The Very Best Of Howard Jones. However, from the label’s point of view it makes sense to kick things off with a compilation which acts as a reminder of the appeal of Howard Jones, as well as including some interesting additional material. “I wanted to include the single releases”, comments Jones in the sleeve notes, “and my favourite tracks from the last 35 years”. Overseen by Jones himself, this collection pulls together a selection of his classic hits alongside tunes culled from his post-80s career. There’s a few surprises thrown in for good measure, such as the strident pop of ‘Eagle Will Fly Again’ which featured on the soundtrack to the 2016 film Eddie The Eagle. The album discards a chronological play order to give the album a more engaging listening experience. As a result, it’s 1985’s ’Things Can Only Get Better’ that kick off proceedings with its combo of brassy horns and clean synth sounds. Meanwhile, ‘No One Is To Blame’ (which was actually Howard Jones’ biggest US hit) takes things down a gear with a lush production courtesy of Phil Collins and Hugh Padgham. The captivating melodic appeal of ‘What Is Love?’ has, surprisingly, lost none of its appeal in the decades since its original release. The smooth synth lines have a timeless quality to them, while Jones’ yearning vocals give the song its heart. Equally, the simple and evocative appeal of 1983’s ‘New Song’ retains a charm and style that established Howard Jones’ talent for euphoric pop. As with many artists of his era, Howard Jones lost his grip on the charts as time went on. This didn’t diminish his knack for melody and composition however. The polished pop of tracks such as ‘Everlasting Love’ and the lush tones of ‘The Prisoner’ still boast a strong songwriting talent, ably assisted by the co-producing skills of ex-Tears For Fears member Ian Stanley. In fact Howard Jones also managed to bring onboard other well-known names to work on his material, such as Midge Ure for his 1992 album In The Running (from which, the soulful ‘City Song’ and perky pop of ‘Lift Me Up’ feature here). The pulsing electronic beats of ‘Just Look At You Now’, from 2005’s Revolution Of The Heart, is perhaps one of the best examples of Jones’ ability to develop his style with contemporary licks. “I think that it’s important that if you’re gonna embrace electronic music that you try and do something new with it and don’t just recreate sounds from the past”, commented Jones in an interview with TEC back in 2010. 2009’s Ordinary Heroes was a more stripped-down affair, presenting a series of compositions that reflected a more mature approach with arrangements dominated by strings and piano. Here, that release is represented by the likes of the wistful ‘Someone You Need’ and the kitchen sink drama of ‘Ordinary Heroes’. The third CD features special acoustic live recordings as well as an exclusive mix of ‘You’re The Buddha’ by long-term collaborator Robbie Bronnimann. The tracks on this bonus CD were previously only available via Howard Jones 2015 book edition of Engage. While this additional CD might seem like overdoing things, it presents some of the musician’s work in a new light – and also shows the enduring strength of the songs to be rendered in a different way. 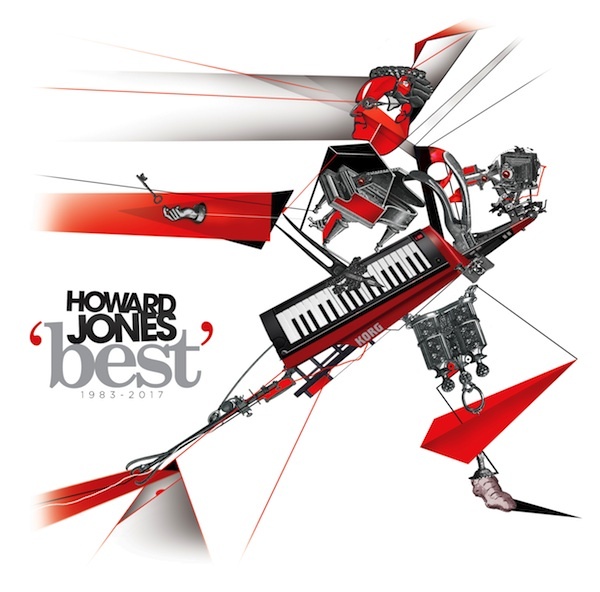 As a collection, Best 1983-2017, manages to present a comprehensive selection of nearly 35 years of the music of Howard Jones. It omits some later singles, such as ‘Angels & Lovers’, ‘Tomorrow Is Now’ and the Donald Fagen cover ‘I.G.Y’, but captures his work in a way that perhaps surpasses a standard ‘Greatest Hits’ release. The CD booklet comes with an interview with the artist himself while the bold, visual style of the sleeve artwork also brings back the design chops of Steg (previously responsible for the Human’s Lib sleeve illustration). Casual fans may be happy with previous compilations, but this 3-CD set will have a special appeal not only to loyal Howard Jones fans, but also perhaps a new audience keen to experience the appeal of this pioneering electronic musician. Howard Jones Best 1983-2017 is out now on Cherry Red. Howard Jones is touring the UK this autumn: 23rd November – ABC Glasgow, 24th November – O2 Ritz, Manchester, 25th November – O2 Institute, Digbeth, 29th November – Tramshed, Cardiff, 30th November – 02 Shepherd’s Bush Empire, 1st-4th November – Electric Dreams Weekender, Bognor Regis. Please visit http://www.howardjones.com/tour_dates.html for full tour details and tickets. Next PostWIN Tickets to SYNTHETIC CITY LONDON!